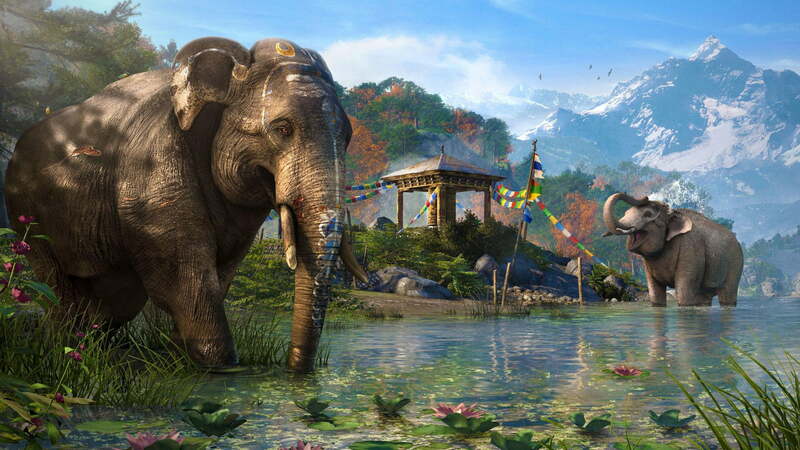 Far Cry 4 is at its best when you ignore the story and focus on the open world's beautiful, living take on unhinged chaos. 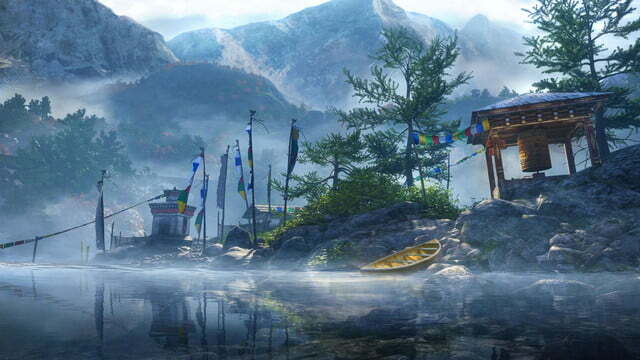 Far Cry 4 has cancer. And not the curable kind. 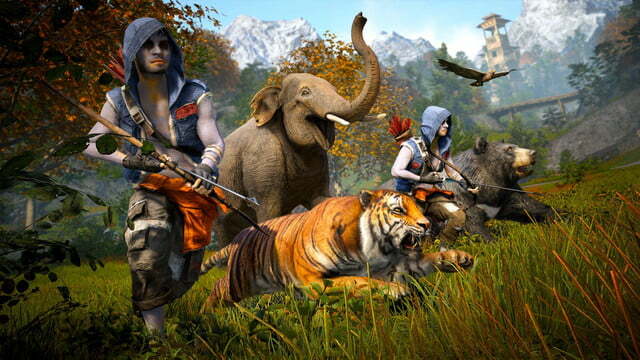 It’s a phenomenal game from Ubisoft’s Montreal studio: an energetic open-world playground that brims over with emergent potential. 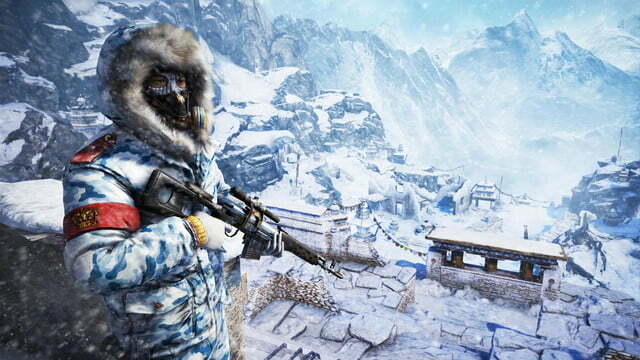 The fictional sub-Himalayan dictatorship of Kyrat that serves as the setting is a living, dangerous thing. Your actions can affect it, but life there continues on with or without your input. How tragic, then, that a world so full of life is constantly obstructed by its own, cancerous plotline. 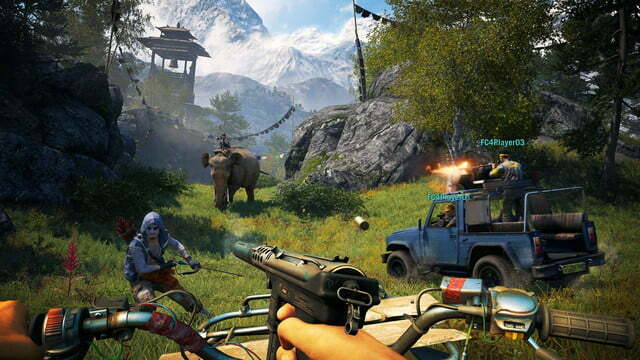 Far Cry 4’s story is idiotic, heavy-handed in all the worst ways, and filled with characters that are either morons or monsters. 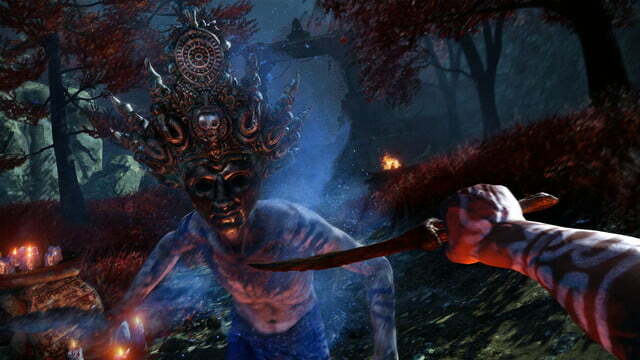 Far Cry 4’s is a story filled with morons and monsters. 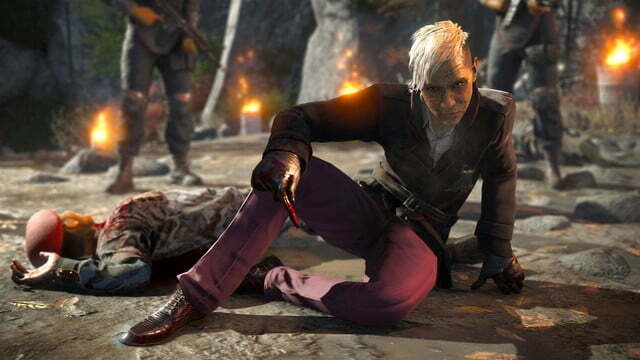 The concussion-inducing script includes folks like Pagan Min, a villain so big he seems to fill the entire game even though he’s only on screen for all of 10 minutes; or Amita and Sabal, dueling leaders who would rather kill each other than find ways to compromise on ridiculous, indefensible notions, like marrying off little girls or re-building the nation around a drug trade. Even so, Far Cry 4 is at least more politically correct than the bro-saves-the-natives “fantasy” that made Far Cry 3 a tonal mess. 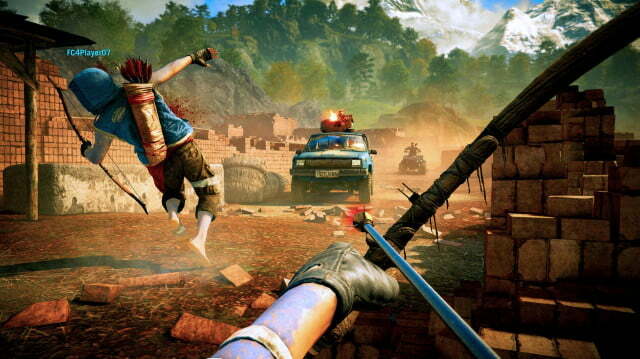 Protagonist Ajay Ghale’s bro factor has been dialed down significantly from Far Cry 3 hero Jason Brody. He’s also a Kyrati expat, which makes the game’s throughline of replacing the local dictator with a traditionalist revolutionary faction more palatable. Ajay is clearly Americanized, but at least it’s not some whiny, out-of-his-element fratboy saving the locals with blockbuster ‘Murican sensibilities. The writing team played it safe, establishing Ajay as a blank slate. 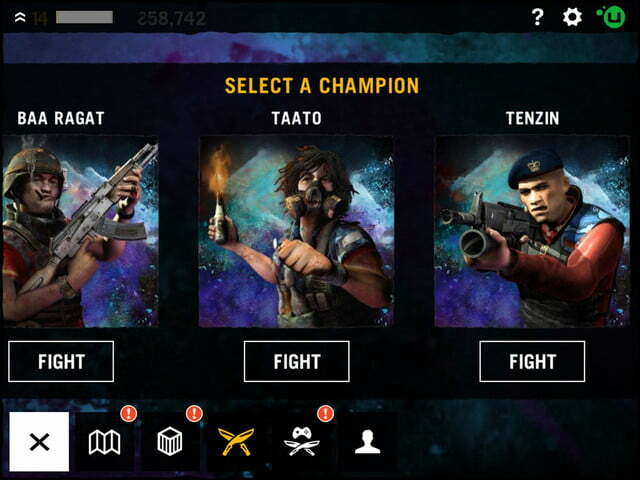 He speaks and he has a history that you can read about on a Wiki, but character development is purely a product of the player’s actions: The choices you make determine not just who Ajay is, but how the revolution he’s the agent of plays out as well. His dad helped spark the revolution, you see, and expat Ajay’s return home is apparently enough to make him a significant player in local politics. Either that, or it’s all the guns he carries. 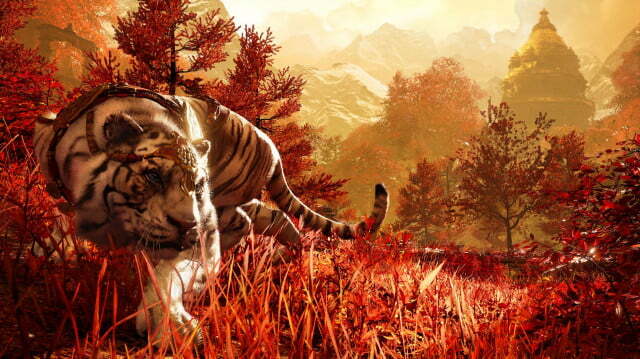 There’s nothing in video games that quite manages to match the experience of a tiger attack interrupting your full-on assault of an enemy outpost. Especially when you can turn the many complex layers of artificial intelligence to your advantage by leading the pursuing big cat into the heart of your firefight, then slipping away to watch the chaos unfold. Far Cry has always been an elaborate house of cards. 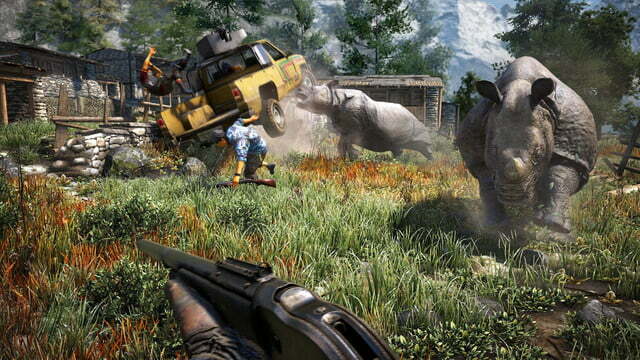 We’ve heard all of this before because that’s what Far Cry 3 did. 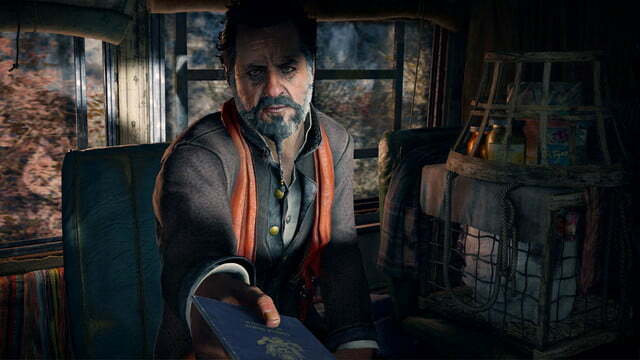 The best stories in that game were the ones you wrote for yourself. That’s as true now as it was before. Moreso even, thanks to an assortment of smaller evolutions, fueled by both the changed setting and the basic process of improving on earlier ideas. 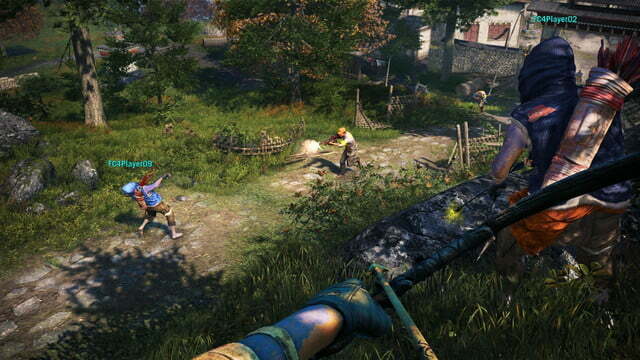 Kyrat’s mountainous setting creates an opportunity to introduce items like the grappling hook, a smartly deployed tool that you use to rappel up and down vertical inclines and swing across chasms. It’s legitimately thrilling to swing out over an open space, launch yourself into the air, and land on a nearby rock outcropping. The wingsuit and parachute from Far Cry 3 return, and they’re handier than ever now thanks to the makeshift launches enabled by the more uneven terrain. They’re joined by a new, single-person “Buzzer” helicopter. Along with the grapple, these are all important enhancements. 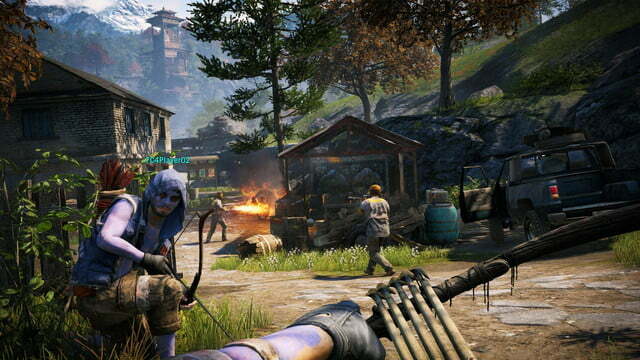 Far Cry’s unique flavor of open-world chaos depends on equipping players with the right set of tools. Vantage points matter a lot, and these new elements help to open up the tactical game significantly. Also notably new is an autodrive feature where, with the click of a button, your car stays on the road, and even drives to any waypoint set on the map. It’s up to you to manage the speed (pressing up/down on the left stick for forward/reverse), and you have enough control to veer around the occasional obstacle (though the AI is also pretty good about it too). 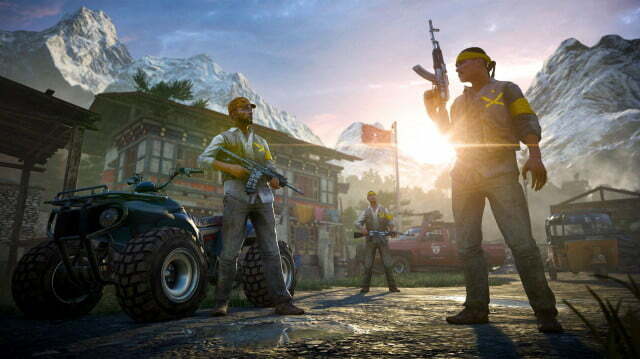 But being able to take your eyes off the road extends all of the freedom and unhinged chaos of Far Cry 4‘s on-foot exploration to vehicle play as well. These are all subtle yet welcome enhancements to a time-tested formula. 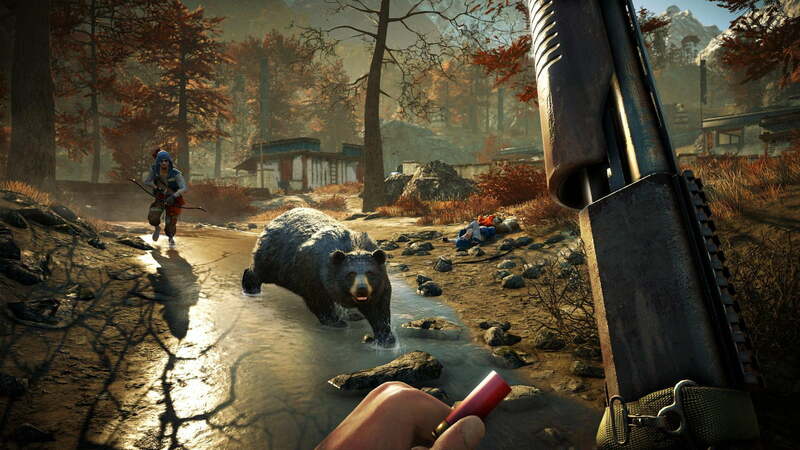 Far Cry has always been an elaborate house of cards that depends on every system and every tool working in concert with one another. 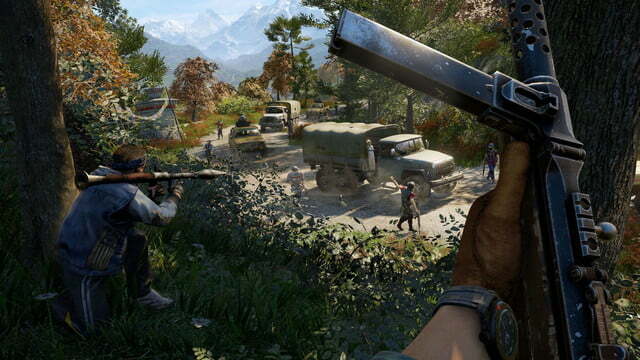 Far Cry 2 established that fundamental DNA, and Far Cry 3 built on it. 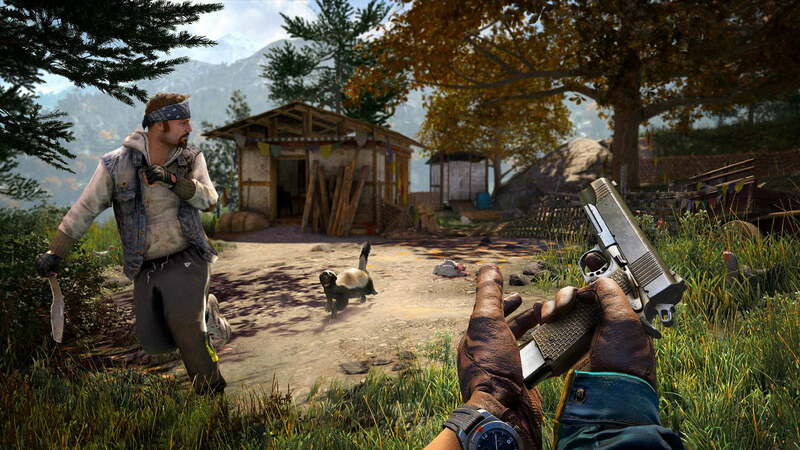 This sequel further perfects it, resulting in a better Far Cry playground than any we’ve seen before. 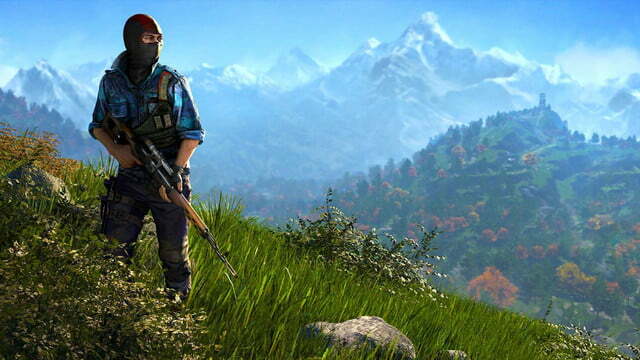 Fundamentally, it’s Far Cry 3 at a higher elevation. That also means you know what to expect going in, since the format remains the same. 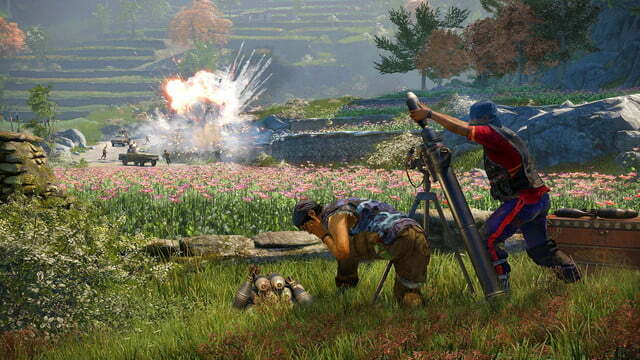 There’s a straight line of story missions that conclude with your toppling of a brutal dictator’s regime, but you can make the going easier by conquering enemy outposts, creating new fast-travel options; destroying propaganda-spewing speakers at the tops of bell towers, revealing more of the map; and hunting, so you can craft larger sacks for your weapons and ammo. It worked in 2012, and it works yet again. 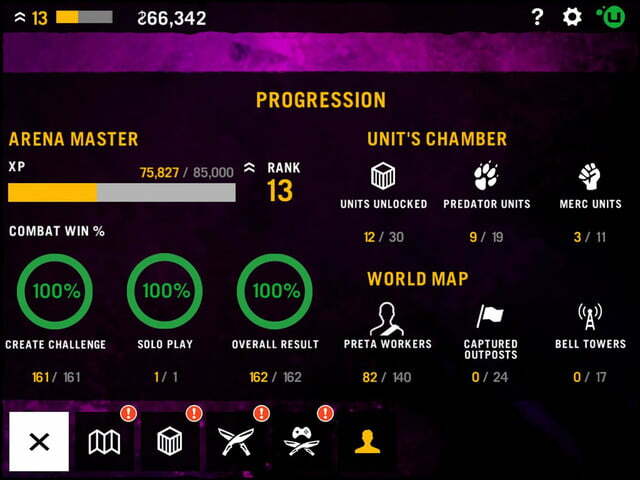 Minor improvements help to make everything more digestible, with an easier to follow menu interface and clearer signposts in the world for each primary and optional mission. 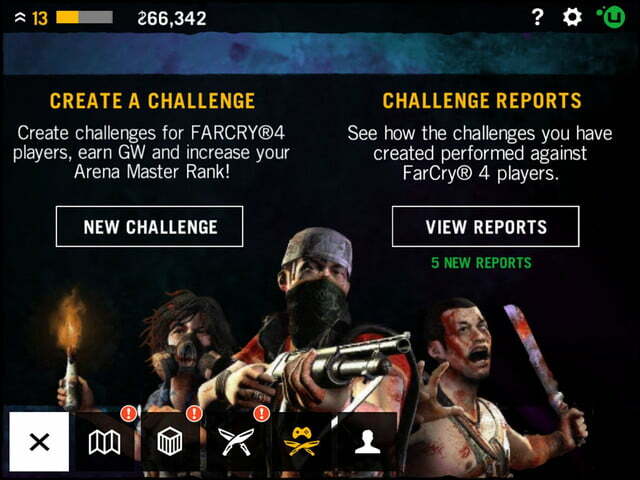 That’s not even mentioning cooperative play that lets you bring a buddy along or custom map creation for the game’s myriad solo challenges (competitive multiplayer is a bit of snooze though). 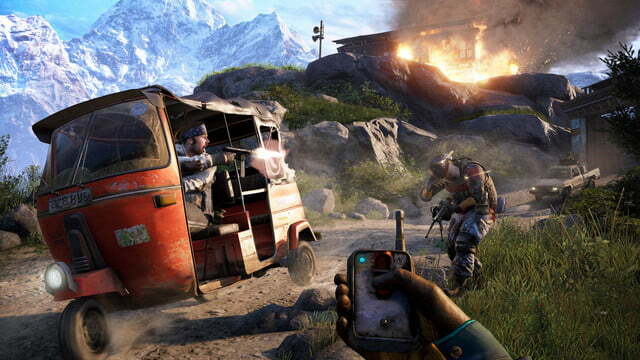 Far Cry 4 is definitely an iterative work, but the iterations are at least strong with this one. It’s just too bad about that cancerous story, always eating away at the heart of the game with its poorly conceived characters and overeager messaging. 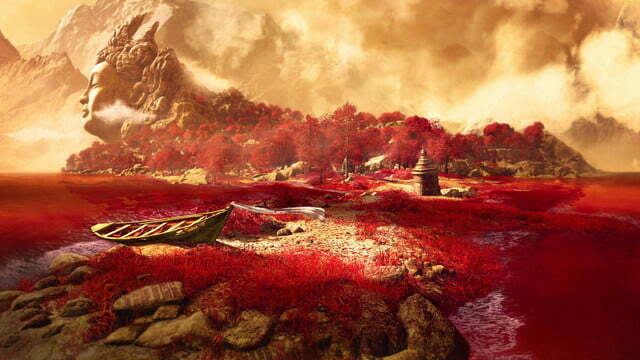 There’s so much fun to be had in Far Cry 4, and none of it has anything to do with the writing. 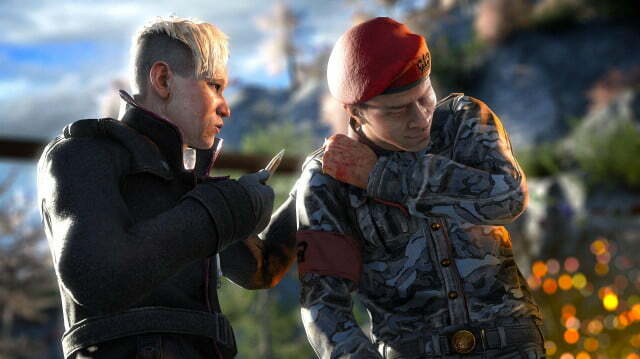 Ubisoft would do well to get out of the way of its own narrative aspirations for future Far Cry games – or at least give them a serious re-think – before the series finds itself trapped in a pit of its own making. 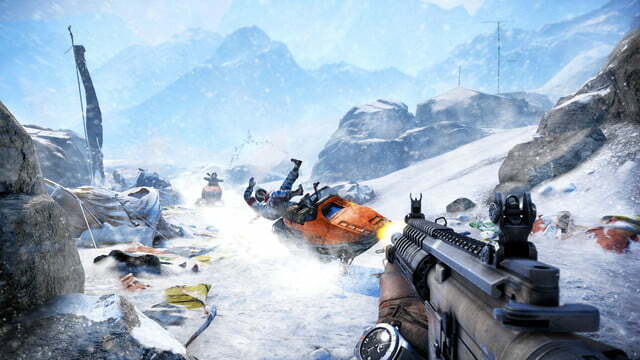 This game was reviewed on a Falcon Northwest gaming PC, with graphics settings optimized by GeForce Experience. Find a detailed specs breakdown here.